Tempur Sealy Commits Additional $1 Million in Mattress Donations to Assist Victims of Hurricane Florence in the Carolinas | Tempur Sealy International, Inc.
LEXINGTON, Ky., Sept. 21, 2018 /PRNewswire/ -- Tempur Sealy International, Inc., announced today an additional commitment of at least $1 million in mattress donations to support recovery efforts in the Carolinas following Hurricane Florence. This is in addition to more than $4 million in donations already made to support victims of hurricanes and wildfires since 2017. Tempur Sealy's commitment will provide mattresses to assist victims in the Carolinas after the devastating hurricane and flooding in the region. Tempur Sealy will work with its long-time disaster recovery partner, Good360, the global leader in product philanthropy and purposeful giving, which coordinates directly with local recovery agencies to meet the needs of families impacted by disasters. "Our thoughts and prayers are with everyone whose lives have been impacted by this disaster. It's been hard to watch the devastation in the Carolinas, particularly given that our company has a significant presence in Trinity, North Carolina," said Scott Thompson, Tempur Sealy Chairman and CEO. "With so many of our employees living and working in areas impacted by Hurricane Florence, we wanted to quickly make a commitment of support to assist when the rebuilding begins." Thompson added that although the media spotlight on the area will soon dim, many residents face a long road to rebuilding their homes and lives. "The hard work of rebuilding homes, businesses and the community will go on for years," he said. "We want the people of the Carolinas to know that we are committed to helping them rebuild the region." Good360 stresses the importance of ensuring that donated items make the maximum impact at the time of greatest need. "Through our disaster recovery engagement, Good360's core focus is to ensure that we get the right goods to the right people at the right time throughout all stages of the recovery process," said Richard Barney, EVP of Partnerships for Good360. "Our partnerships with local nonprofits serving the community and with corporations like Tempur Sealy make it possible for us to move product to where it is needed most." Good360 is currently engaged in disaster recovery efforts in Texas, California, Florida, Louisiana and Puerto Rico, among other locations. The partnership between Tempur Sealy has helped thousands of families begin to rebuild their lives following natural disasters. 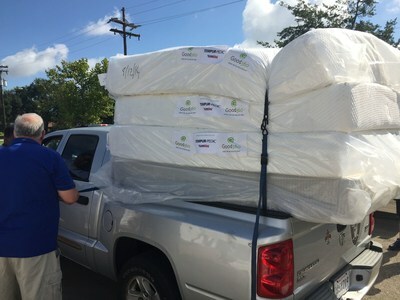 Since 2011, Tempur Sealy has donated nearly 200,000 mattresses to charity, with a focus on disaster relief, family and children's charities, first responders and military organizations. Tempur Sealy International, Inc. (NYSE: TPX) develops, manufactures, and markets mattresses, foundations, pillows and other products. The Company's products are sold worldwide through third party retailers, its own stores, and online. The Company's brand portfolio includes many highly recognized brands in the industry, including Tempur®, Tempur-Pedic®, Sealy® featuring Posturepedic® Technology, and Stearns & Foster®. World headquarters for Tempur Sealy International is in Lexington, KY. For more information, visit http://www.tempursealy.com or call 800-805-3635.